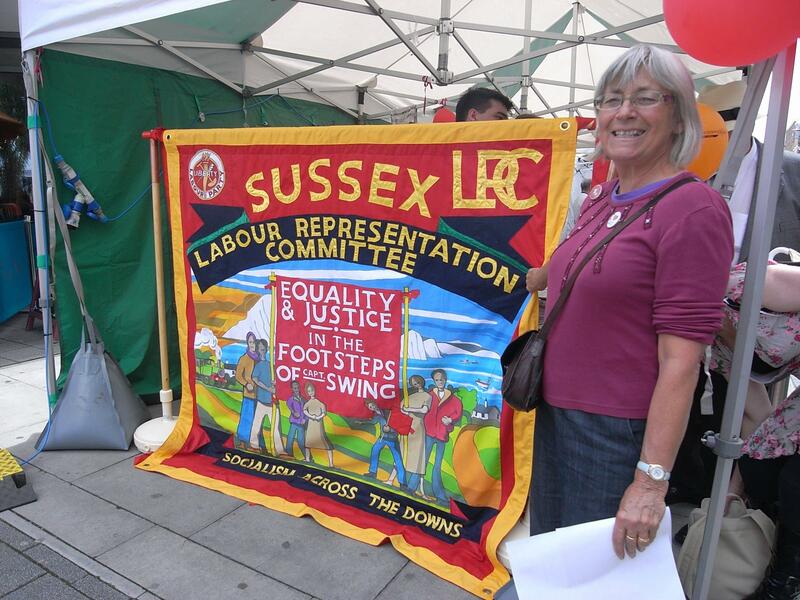 Sussex LRC members were overwhelmed and delighted by the positive response we received from people to our stall at Brighton & Hove People’s Day 2012. Thanks to everyone who stopped by – even a few abusive visitors only served to spur us on! (c) Fred Pipes. All rights reserved. The 68 is too late campaign opposes the mandatory increase in the state pension age as unfair and discriminatory against those on low incomes and in manual occupations. From our stall we distributed the campaign leaflet and gave away copies of the model motion – encouraging those interested to move the motion through their trades unions, Labour Party banches or other organisations. Many people also took free copies of the informative Fair Pensions For All booklet jointly backed by 5 of the main sponsors of this campaign. Subsequently, we are delighted to report that just a week after our stall, members of Brighton, Hove & District Labour Party overwhelmingly passed the campaign’s model motion when it was moved by Sussex LRC members. The Coalition seeks to irreversibly privatise the NHS – perhaps Labour’s greatest achievement which, it should never be forgotten, the Tories opposed from the outset. We ran both the local and national petitions for Defend the NHS/Keep Our NHS Public during the day, which received overwhelming support from all visitors to the stall. It is our view that the Labour Party should be fully engaged in these campaigns locally, to cement Labour’s national commitment to repeal the destructive Health & Social Care Act. Consequently, the next meeting of B&H LRC will focus on the NHS. Save Remploy – stop the closures! The Coalition’s callous destruction of the lives & livelihoods of people, both locally and across the country, has been demonstrated by its policies of job losses, benefit cuts and the demonisation of benefit claimants. This was typified in the week before People’s Day with the casual announcement of the closure of the Remploy factories – which Labour set-up as protected workplaces after WW2. We informed people that the Remploy workers are continuing to fight to save their jobs, countered some of the mis-information that the general public has been exposed to through the Tory media and gathered countless signatures in support of the “Save Remploy” petition. Thanks to everyone who signed, both at People’s Day and at B&H DLP on 21/05/12 – we have sent those petitions off. During the day we also ran a B&H quiz for adults and had socialist-themed games for kids. No one submitted a new design for the now famous Sussex LRC badge collection, although quite a few badges were sold and many stickers and other campaign literature given away. Thanks to Unite the union, PCS and TUC Future that Works for materials, which we were delighted to distribute. Thanks also to Alex and Anne who worked hard all day on the stall, as well as to Ed Hall who designed our banner – that was a focal point of our display and attracted many people to our stall. Lastly, thanks to the most delightful young lady lion whose political education we hope we got off to a good start! We had fun & games running this Sussex LRC stall and would recommend the experience to others. We judge it to have been a success especially since, subsequently, the local Labour Party has been receiving praise and taking credit for organising such a great Labour stall. A bit cheeky perhaps, but we have no real objection since, if you reflect on this, it is brilliant to know that everyone we spoke to identified LRC policies as Labour Party policies. Now to work upon this inside the Party!